Data speaks best through visuals, not words – so believes renowned data journalist and TEDtalks speaker, David McCandless. According to him, 80% of all that we learn gets imbibed visually, and research would have to agree. Three groups of economists participated in a study where they were given a dataset and asked everyone the same question. Of the group armed with only the data and standard statistical analysis, 72% got the answer wrong. Another was provided the data, the analysis, and a chart as well – errors dropped to 61%. But (and here’s the catch) the final group had only the go-to chart. And only 3% answered incorrectly! The power of charts to aid accurate interpretation is, to put it plainly, mindblowing. That’s why users across the globe are increasingly looking at charts (or graphs) and pictorial representations to maximize the information at hand. However, it could be a challenge to align visualizations to available datasets correctly, and the ultimate business needs. The same numbers can be shown in several ways, and when creating a dashboard, multiple charts must weave into a seamless fabric that together tells a story. This requires a clear understanding of information and what it must achieve: does a visualization need to highlight differences? Should it highlight how one component fits into the whole? Does it need to show distribution? And should individual data points catch the eye? These questions are, potentially, endless. But answering them accurately could save a lot of effort in the long-run and prevent slip-ups that makes the user question both accuracy and efficacy. 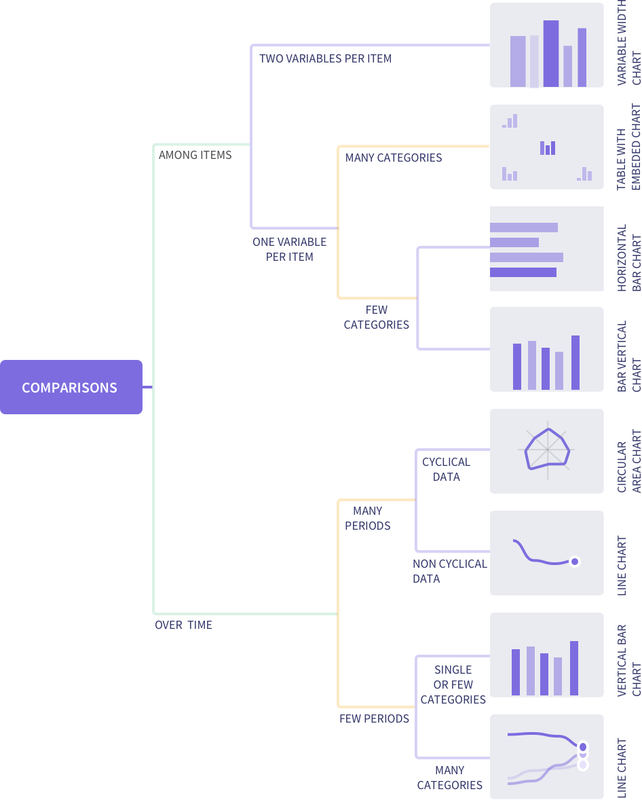 We did a quick breakdown of the most common use cases for data, which could be part of multiple business scenarios, and how best to visualize them. Are you showing trends – that is, is the difference over a period critical to your story? Do you have to focus on specific data points? A line chart is a good alternative as it plots values on the Y axis and time on the X-axis. This could be in hours, days, months, or quarterly intervals, making it a big favorite in marketing & sales. 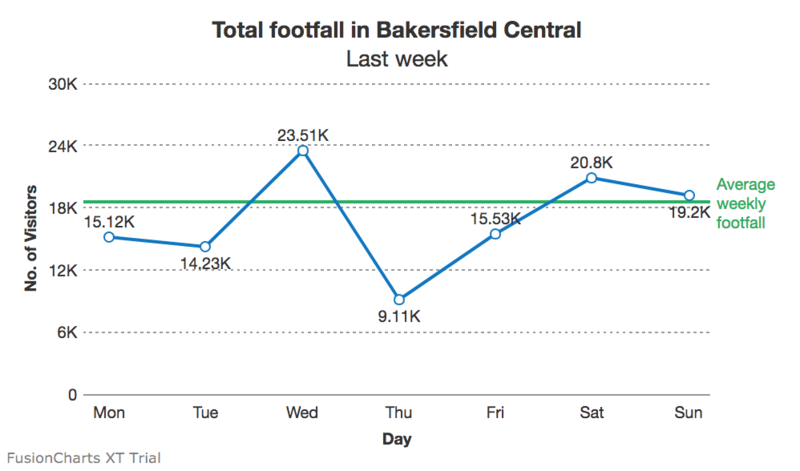 Daily web traffic or quarterly sales, for instance, are perfect for line charts. Also, as several lines can be plotted on the same canvas, line charts open possibilities of comparing multiple trends at one go. No, the total volume is more important. 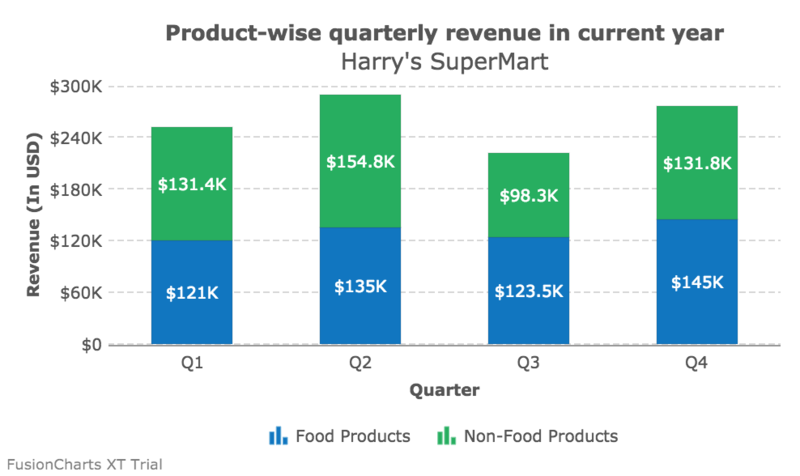 Consider area charts – like line charts, these too plot change over time with a significant difference: the space between lines and axis is filled in. However, more than 4-5 lines on the same chart could be distracting, and it’s difficult to zero in on specific values. Tooltips, legends, and other contextual information should be intelligently used when creating area charts. No, there is no linear progression of the datasets. 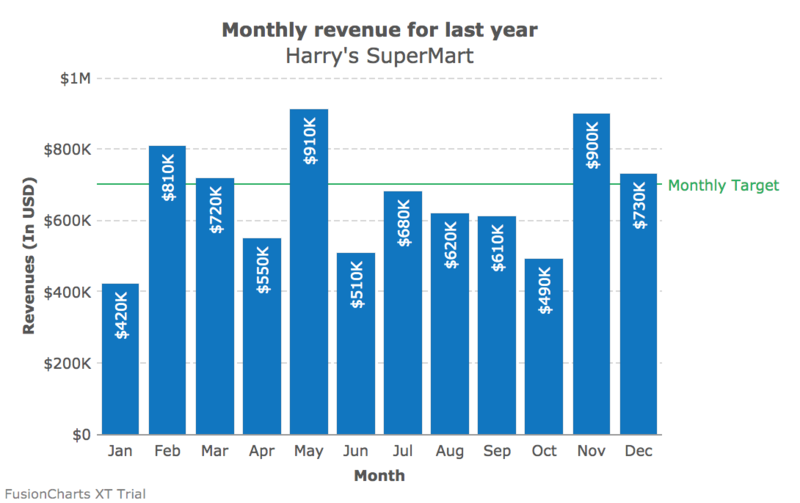 Columns and bars are go-to options for all things comparison, especially if there’s no temporal element involved (though the X axis could show years or month as well). However, in the absence of direct lines drawn across the data points, these have emerged popular for non-linear data – population by capital cities, for example, or ROI from different departments. 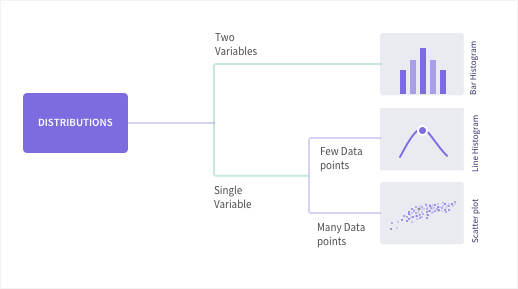 Given the amount of space available, bars and charts perform roughly the same function – however, in case of columns, it’s easier to spot if a data value is below a standard threshold. Bar charts are better suited to show if the data values have reached (or are close to reaching) a particular target. Additionally, bars can also hold a more substantial number of fields, without leading to clutter. No more than comparison, the chart should accurately portray distribution and let the user draw her conclusions. Do you have to show a wide range of datasets? 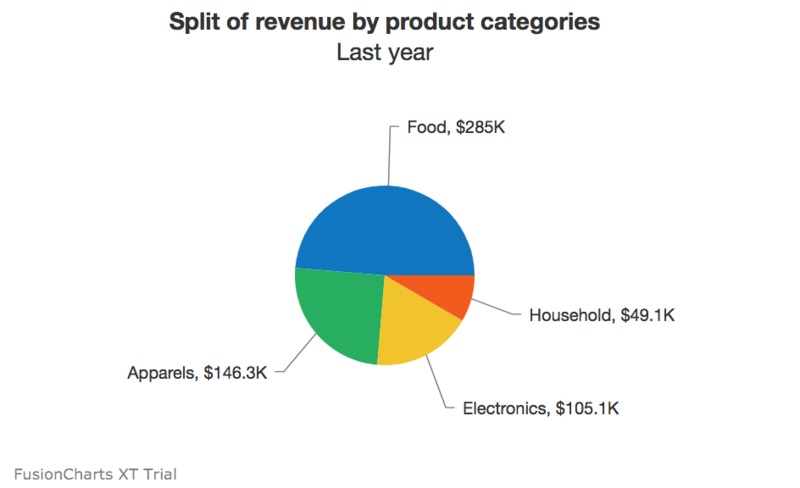 Pie-charts find a place in the majority of visualizations that plot distribution. However, since all the values are shown as percentages of the whole (100%), there’s a limit to the number of segments it should contain. Avoid 3D imagery or tilt, as they interfere with the at-a-glance angle comparison pies are known for. Treemaps are marked by their ability to contain a significant amount of data, smartly and efficiently. Different colored rectangles show all the parts of a whole. There’s also a comparative aspect to it – because the segments are arranged according to hierarchy, the user can quickly scan and derive insights. 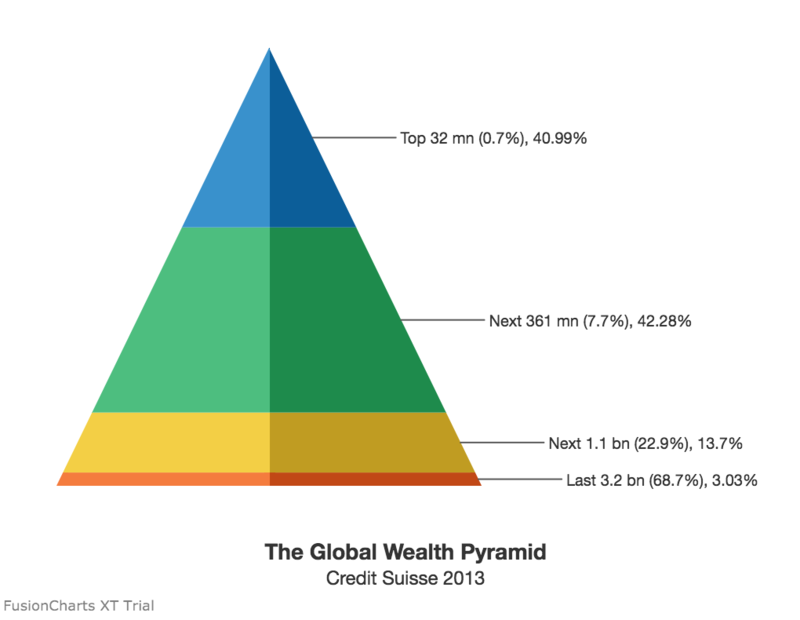 Is hierarchy crucial to your data, with a clear top-bottom distribution? Another alternative for showing ordered distribution is the pyramid. The uppermost rungs have the lowest values, and the bottom shows the most common instance. Take the archetypal food pyramid, where the staples are at the bottom, and infrequent components are at the top. No, but the frequency of elements should stand out. Word clouds are explicitly built to suggest frequency and distribution, without highlight the actual numbers. A popular application is for SEO marketers – what are the key terms that pepper user conversations, and which words should take center stage when creating content? As the deeper intricacies and detailed numbers are essentially ‘blackboxed,’ word clouds could be *technically* considered outside the scope of charts. However, they could prove to be a useful visualization tool in real business scenarios. But comparison and distribution have to go hand in hand. Stacked bars and columns pack in a range of data, clearly and accurately, for easy analysis. While individual bars/columns show how the data changes across time, departments, or other factors, the colored ‘stacks’ in each bar/column shows the distribution of components. Take the simple instance of illustrating population – columns show how the total number changes year on year, while the stacks in each column indicate the flux in male and female numbers. 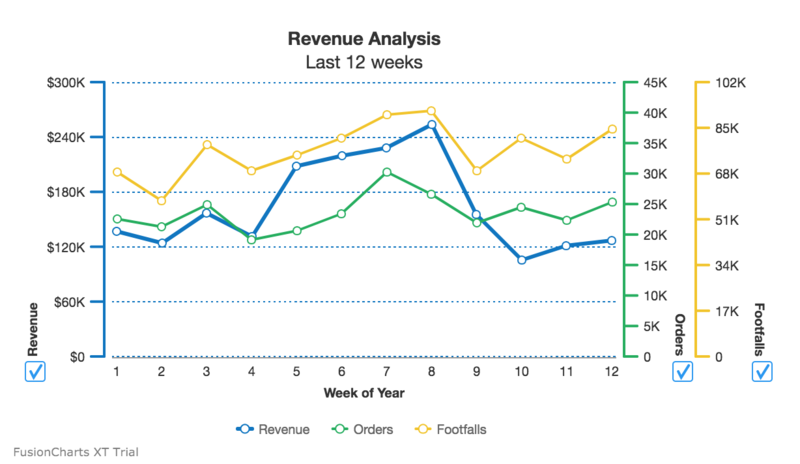 Line charts can also use two Y axes to help compare different (but linked) variables, like the number of items sold and net revenues. Not only do these need separate units, but they also depend on a host of other factors – price/per item, for one, or the cost of resources utilized. Dual Y-axis maps both datasets on a single canvas, allowing the user to spot possible patterns, combinations, and exceptions. Just too many numbers and all of them are critical! 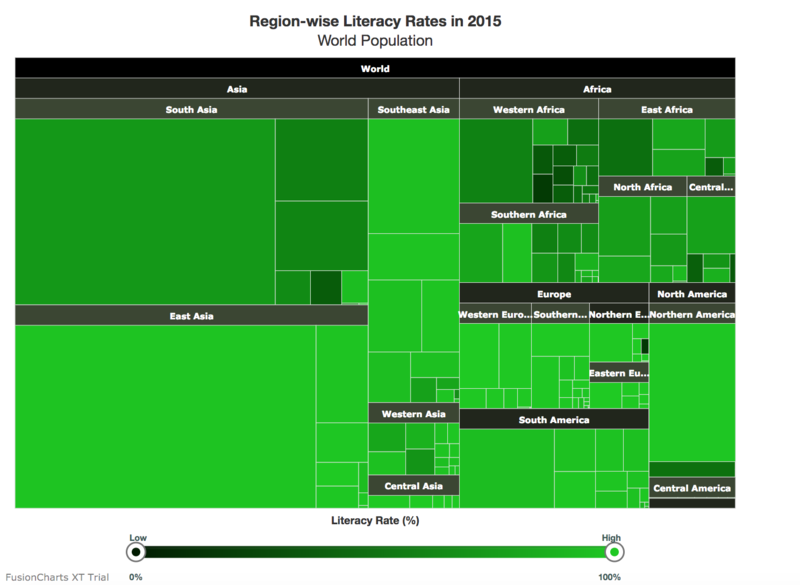 Charts condense data into the very essentials and let users visualize the bigger picture. 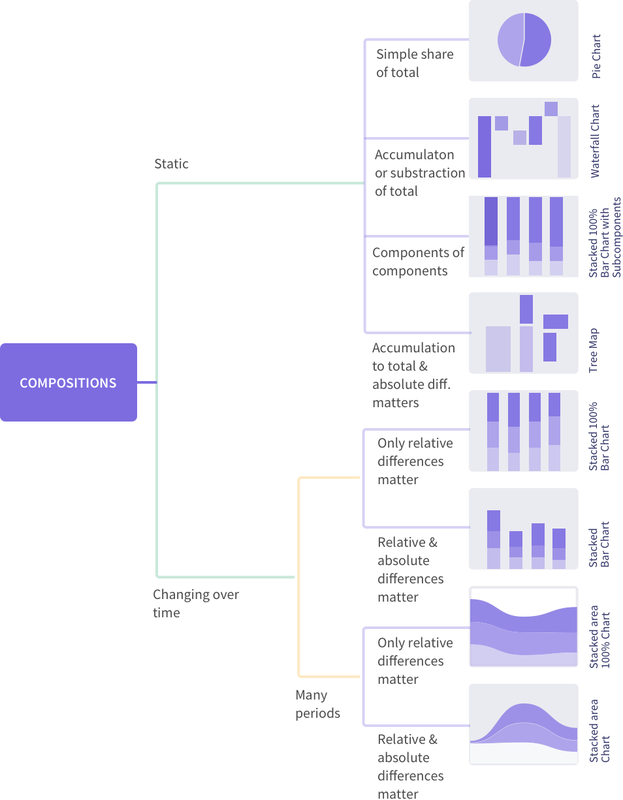 No matter how complex, charts must intelligently arrange data and have to include powerful drill-down capabilities if the user is to dive into the fundamentals. That’s where tables come in – they’re not meant to compete with the bold, colorful visuals of charts and word clouds. However, they offer a set of unique benefits – data searchability, combining detailed views and summaries in one snapshot, and the inescapable truth that almost everyone knows how to read a table. When it comes to data visualization, there’s no one size fits all approach. These best practices could inspire innovative combinations, where charts are employed with an eye on usability, instead of just ‘getting it right.’ And if the shoe fits, the result is a visualization that one day becomes the next industry standard – like the sparkline. At just 20 years old, give or take, sparklines are micro charts that sit beside tabular data, visualizing the numbers, in miniature. One of its earliest documented applications was in 1998 when UI designer Peter Zelchenko used what he called ‘inlines’ to show stock price changes on a PC trading platform. The innovation went on to steal heart, screens, and investments, eventually becoming a global standard for a particular visualization use case. So keep exploring un‘chart’ed territories, make way for new visualization ideas – the next sparkline might be just beyond the horizon. 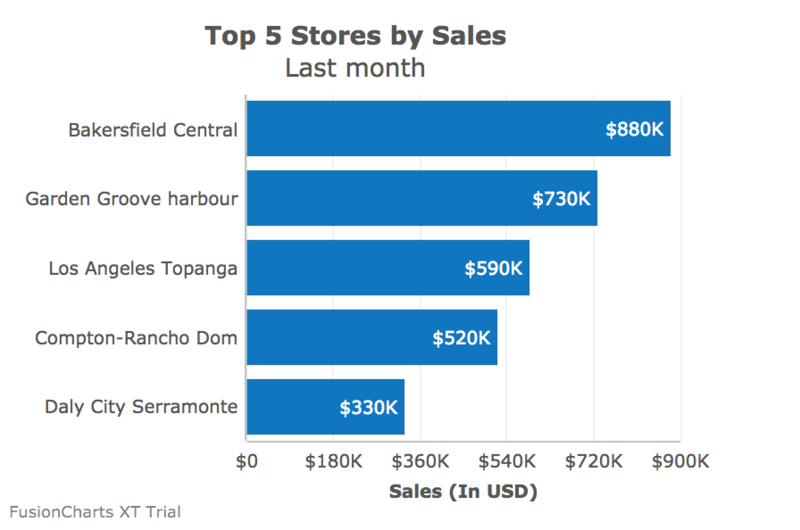 If you’re wondering how to put these charts on the limited real estate of your information dashboard – here’s a comprehensive guide to designing dashboards that yield insights.